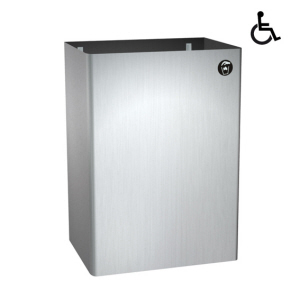 If you are looking for commercial grade waste containers, ASI JD MacDonald offers an extensive range of stainless steel waste bins in a variety of styles and sizes. 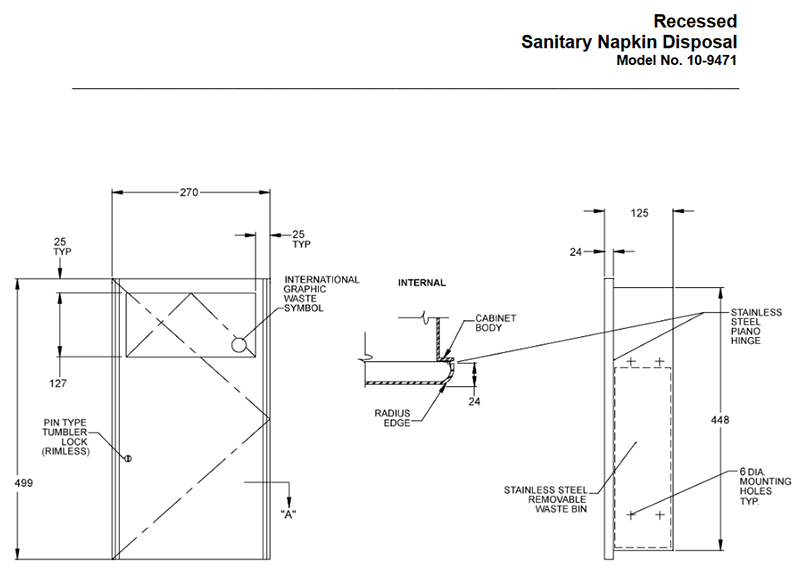 Their designs reflect functionality, durability and easy maintenance and are sure to provide you with the perfect fit to suit your washroom needs. seamless and has a bowed face and gently radiused front vertical edges. Satin finish 22 gauge type 304 stainless steel. AS10-20472 is also available. 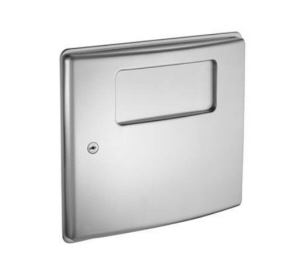 Same as 20470 but mounts through partitions up to 1 1/4" thick. 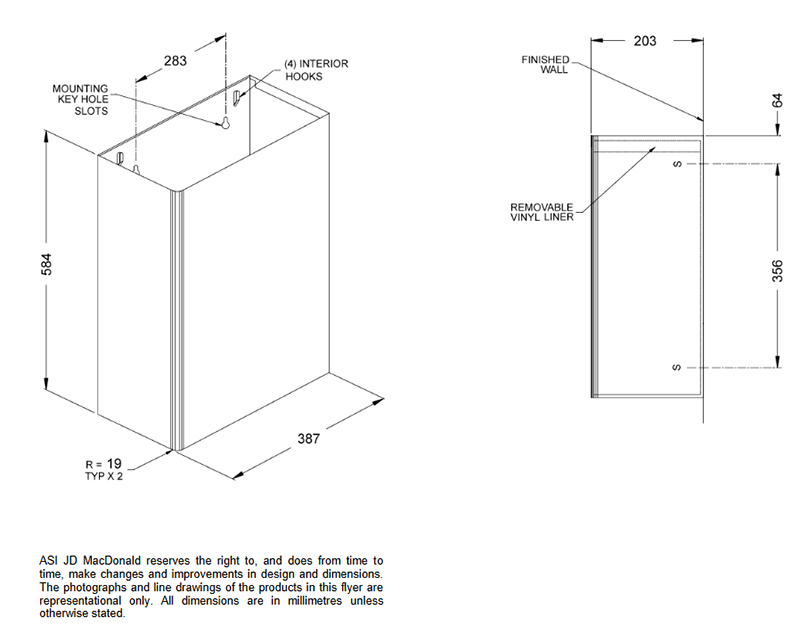 Expandable steel waste can ensures a perfect fit for thicker partitions. 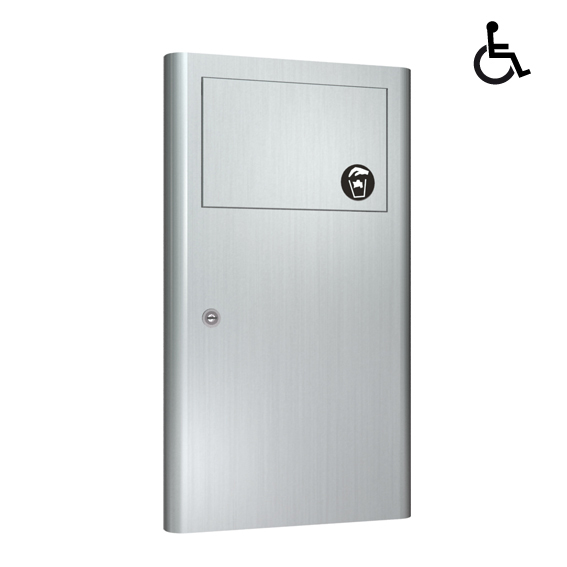 Cabinet Full door shall be drawn seamless and shall have bowed front face and gently radiused edges for extra strength and complimentary appearance for modern washroom aesthetics. 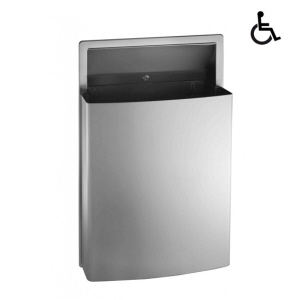 Surface Mounted Sanitary Waste Bin Roval Collection can hold 3.8L of wastes. 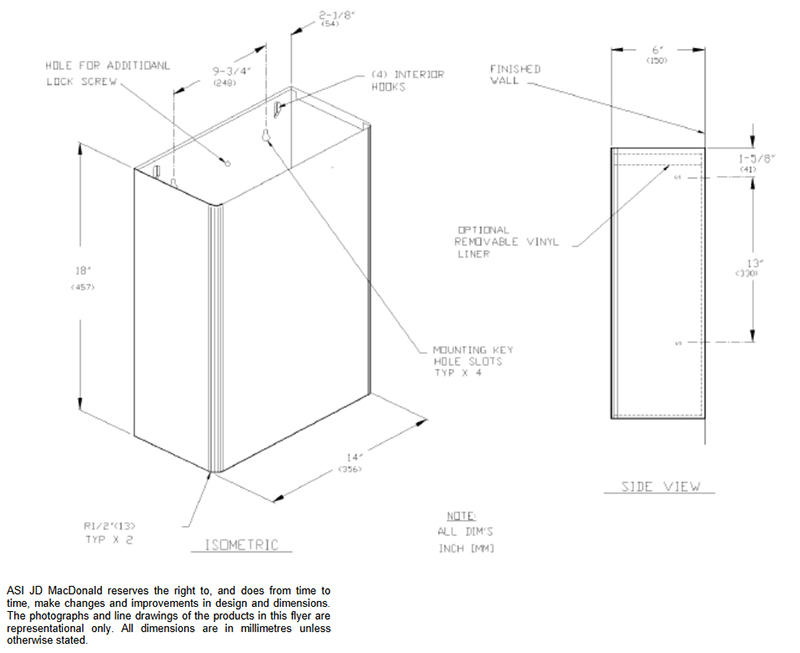 Lid is drawn one-piece construction and is secured to the cabinet with a heavy- duty 3.5 mm multi-staked concealed piano hinge. Receptacle body is formed seamless and has a bowed face and gently radiussed front verticle edges for adde strength and complimentary appearance for modern washroom aesthetics. 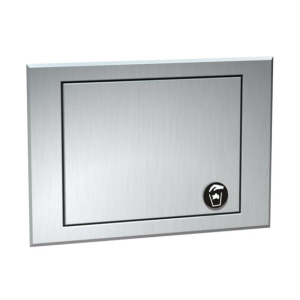 Surface Mounted Sanitary Napkin disposal which door and cabinet is fabricated of alloy 18-8 stainless steel grade 304, 22 gauge. 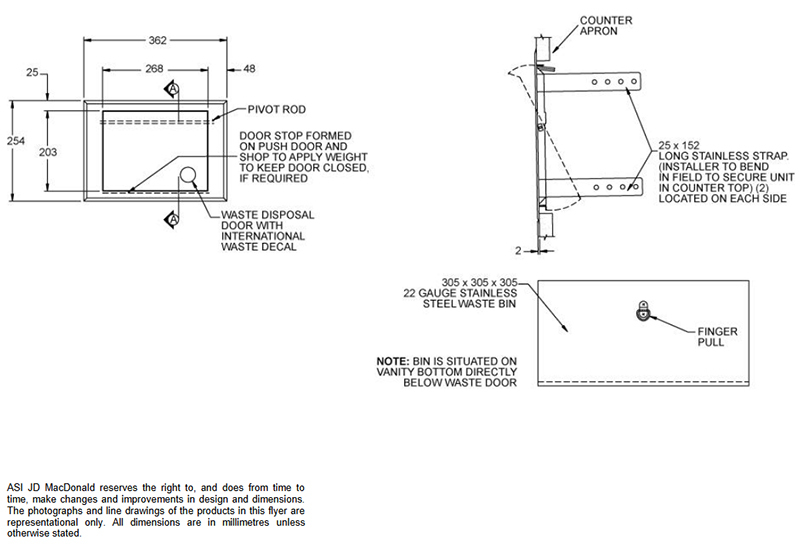 Top cover is attached to cabinet with a full length 55mm diameter stainless steel multi-staked piano hinge. Top cover shall have lift handles at each end fabricated as one piece with top. 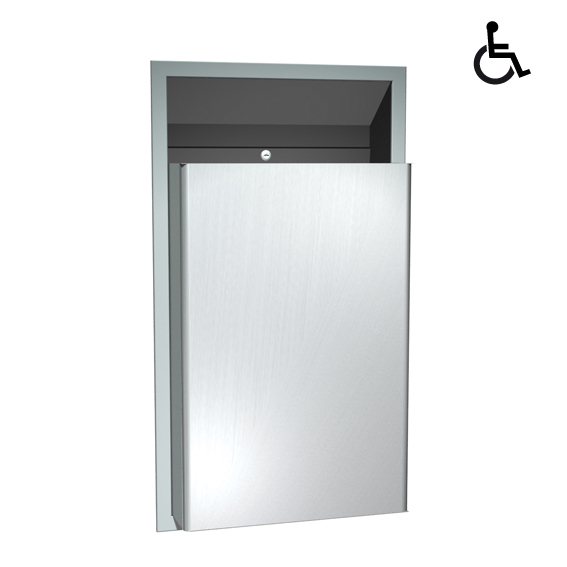 Recessed Sanitary Napkin Disposal with 7L waste capacity featuring a self-closing stainless steel push door that covers the disposal opening. 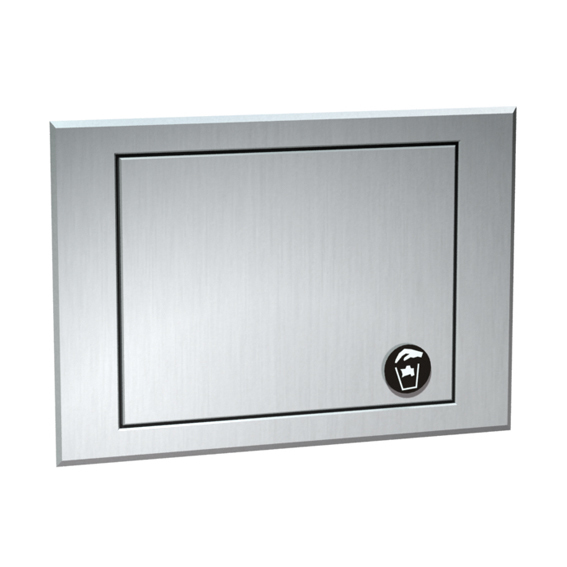 Satin finish 20 gauge cabinet with 16 gauge stainless steel door. 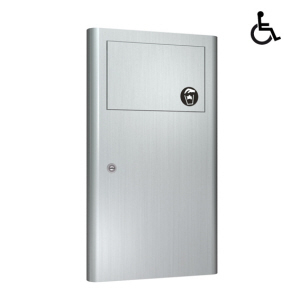 Door is attached to the cabinet body with a 5mm diameter stainless steel multi-staked piano hinge and held closed with a tumbler lock keyed similar to other ASI JD MacDonald washroom equipment. 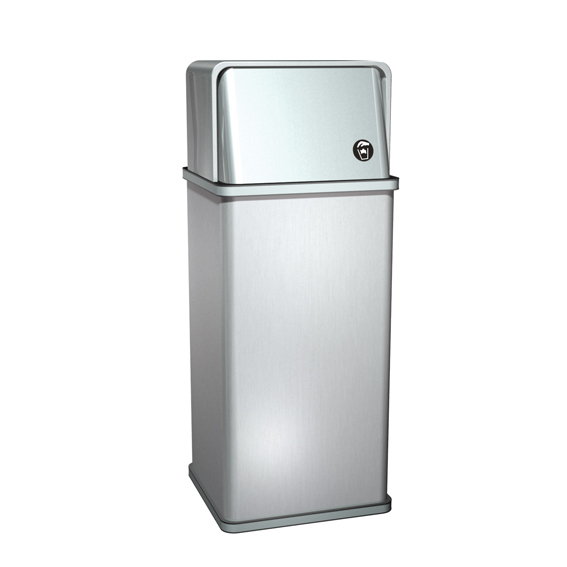 Surface Mounted Waste Bin Traditional Collection has a capacity of 7.6L. It is fabricated of alloy 18-8 stainless steel, grade 304. 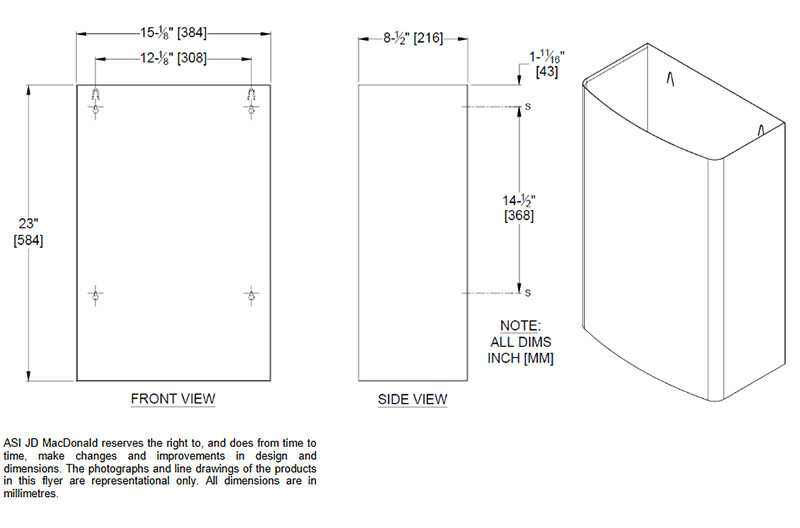 22 gauge with No.4 Satin Finish and be protected during shipment with a PVC film easily removable after installation. 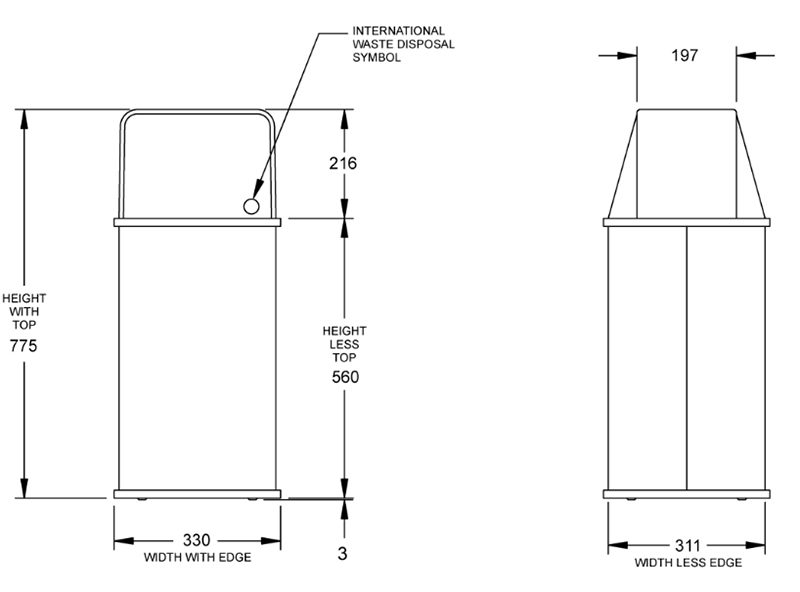 Bin has no exposed fastening devices or spot welded seams and have front outer edges rounded to 13mm radius. 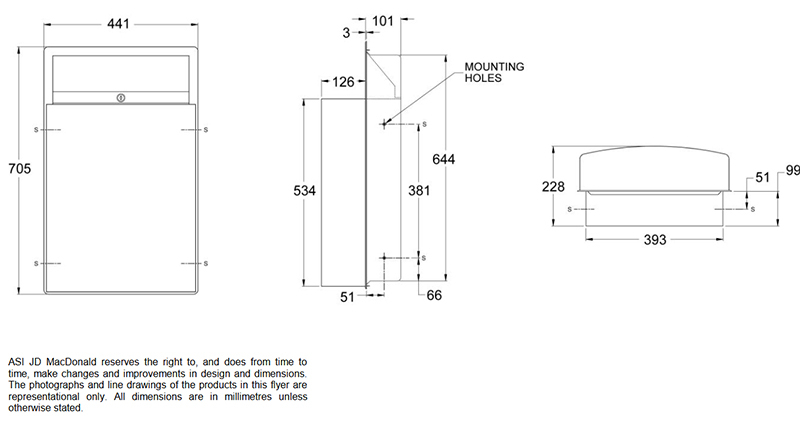 It is provided with 4 'key hole' slots on rear for hanging on pre-installed screws. 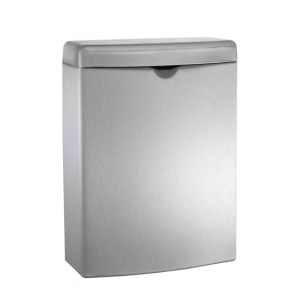 Counter Top Waste Bin receives 28L of solid waste into loose waste bin, door and face trim are fabricated of alloy 18-8 stainless steel grade 304, 18 gauge. All exposed surfaces have No.4 satin finish and protected during shipment with a PVC film easily removable after installation. Face trim is one piece construction with no mitres or welding. 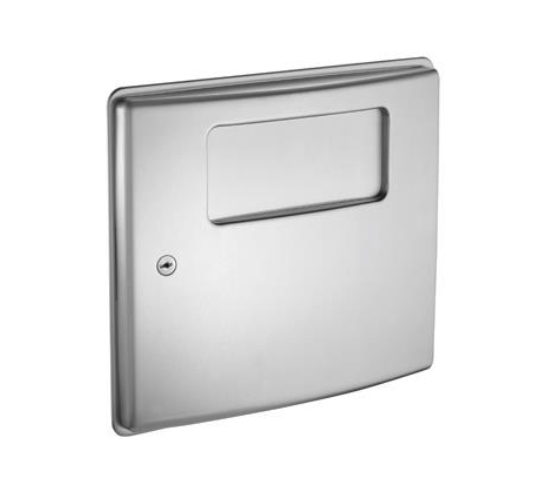 Available in counter top and vertical mounting. 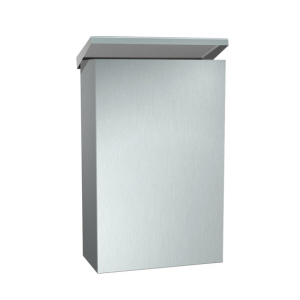 Wall Mounted Waste Bins made of satin finish 22 gauge stainless steel. Hemmed top and bottom edges for safety. Receptacle has 4 interior hooks for hanging a reusable heavy gauge vinyl liner bag with grommets (purchased separately). These waste receptacles have a capacity of 64 L, 45.4L, and 24.8L you can choose from. It has no exposed fastening devices or spot welded seams and front vertical edges rounded to 13mm radius. 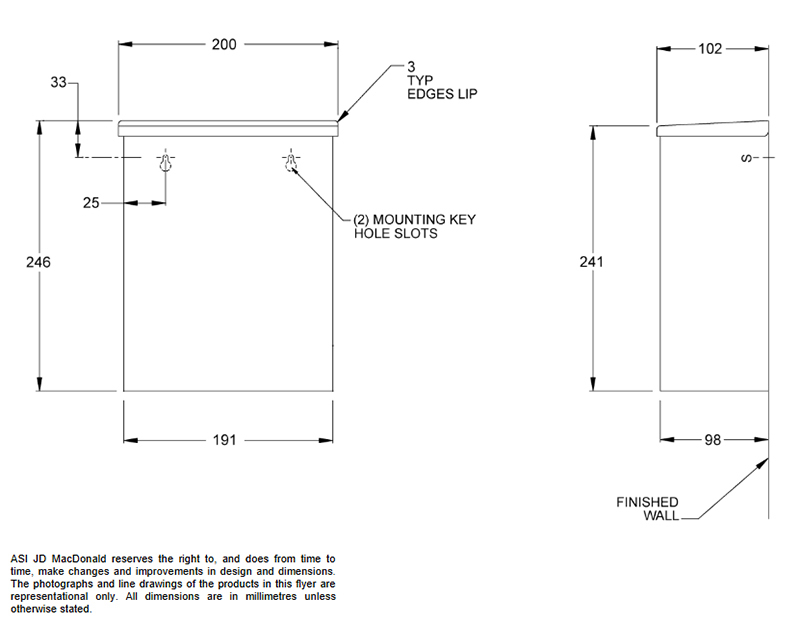 Bin shall be mounted to wall through 'key hole' slots on back of unit which prevents theft after installation of concealed locking screw. 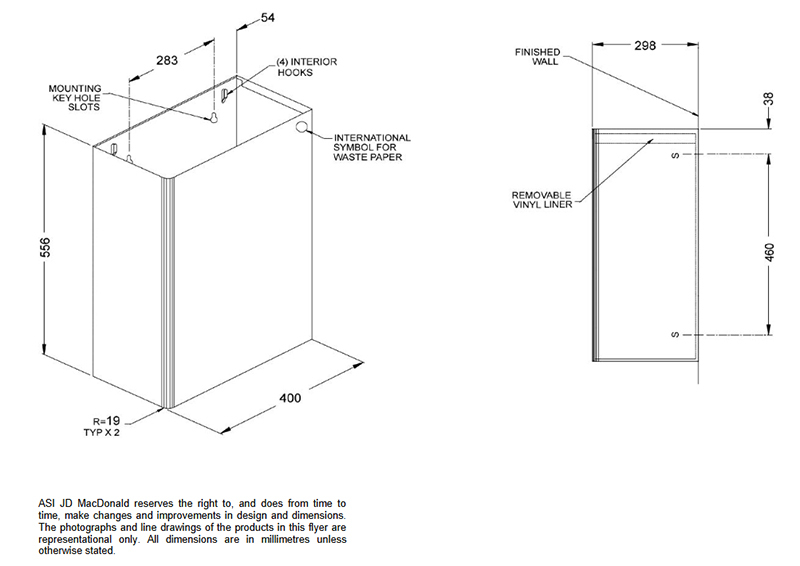 Semi-recessed Removable Waste Receptacle which has a capacity of 42.6L. 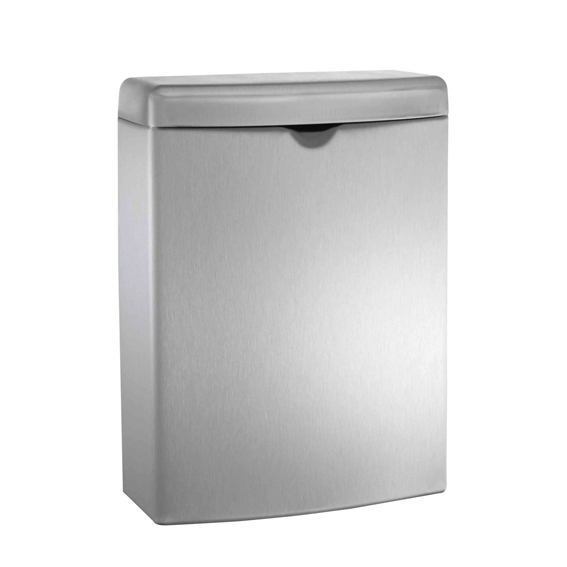 Easy to maintain stainless steel waste bin locks into 22 gauge cabinet with a tumbler lock for security. 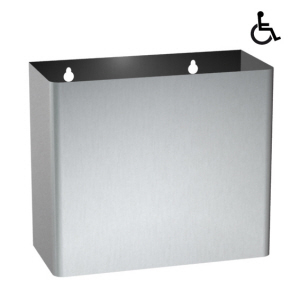 Receptacle body is formed seamless and has a bowed face and gently radiused front verticle edges for additional strength and complimentary appearance for modern washroom. These Traditional Collection Waste Bins 46L have Satin finish 22 gauge stainless steel. Waste container locks into cabinet. 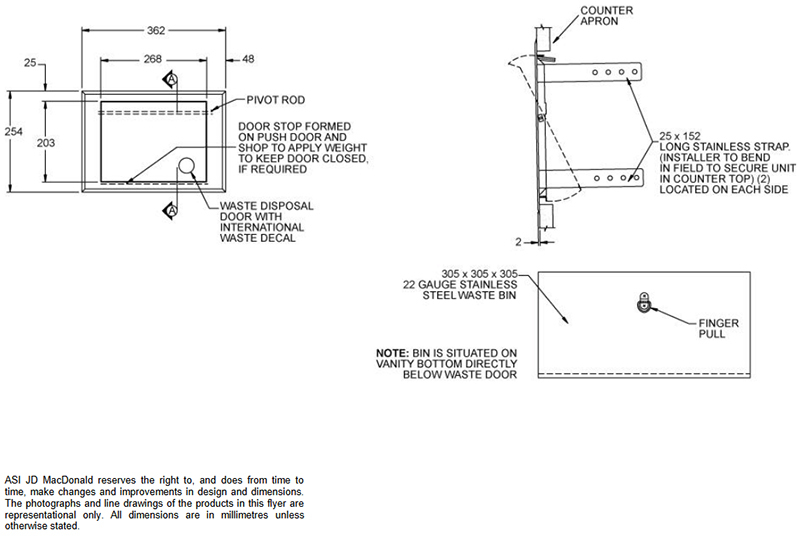 Frame, waste bin and cabinet shall be fabricated of alloy 18-8 stainless steel, grade 304, 22 gauge. Receptacle has 4 interior hooks for hanging a reusable heavy gauge vinyl liner bag with grommets (purchased separately). AS10-0458-9 is the same as AS10-0458 but with trim to surface mount. 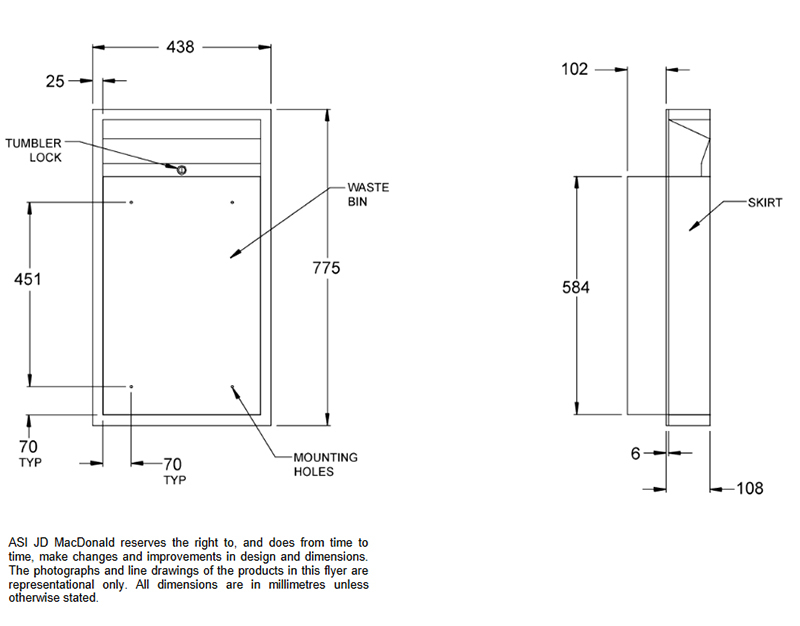 Surface Mounted Waste Bin Roval Collection can hold 48.4 litres of waste. 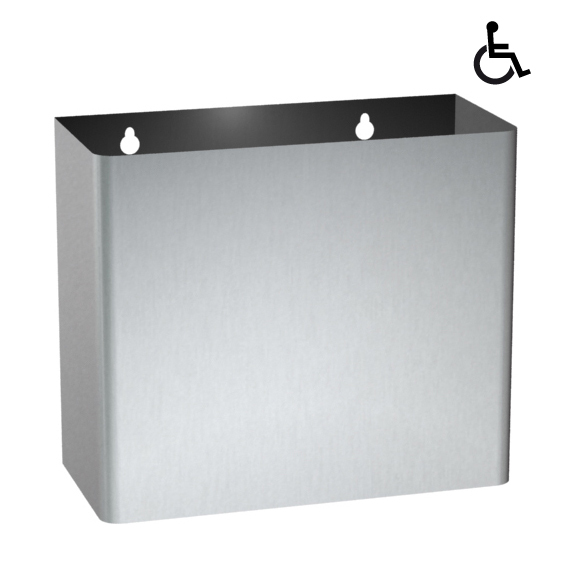 Receptacle body is formed seamless and has a bowed face and gently radiused front vertical edges for extra strength and complimentary appearance for modern washroom. This sanitary waste bin shall be 22 gauge type 304 stainless steel alloy 18-8 with satin finish and be protected with PVC film during shipment. 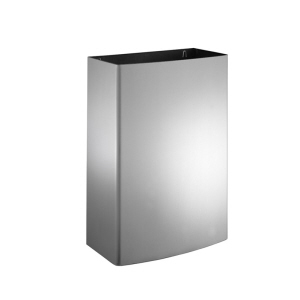 Free Standing Waste Bin made of satin finish 22 gauge stainless steel. It has self-closing doors on top with vinyl wall bumpers, rubber feet and hooks for disposable liners. This waste receptacle has a capacity of 54 L and 73L that you can choose from. You can also choose either with or without lid. It has no exposed fastening devices or spot welded seams. 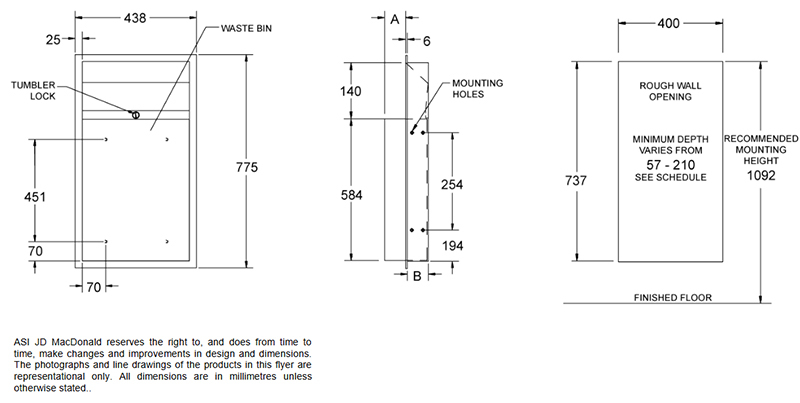 Free Standing Waste Bins (Traditional Collection) have two continuous vinyl wall protectors, top and bottom, around entire perimeter. Unit has hooks for interior liners.